Question: What do you get when you have Dutch, Chinese, American and Italian joined together? Answer: Mighty good eating if I’m referring to international cuisine. But since I’m writing about food for the soul, the new PrimaLuna DiaLogue Premium HP power amplifier is the tasty audio dish that I am referencing. PrimaLuna has been a company since 2000, started by the Netherlander Herman van den Dungen who coined the Italian brand name in honor of his grandfather. For the uninitiated, one can get the origin of the company name from the back of any PrimaLuna owner’s manual. To achieve high quality and dependability at reasonable prices, Mr. van den Dungen turned to Chinese manufacturing but with an eagle eye to strict quality control and adherence to design standards. I’m sure many Dagogo readers are familiar with the PrimaLuna brand, but for those who are not, the company offers audio components which are value-packed with forward thinking safety and convenience features at relatively affordable prices. The new DiaLogue Premium HP power amplifier retails for $3,899. Much have been written about the various features, either in the high-end audio press or on the PrimaLuna USA website, so rather than rehash the available information I refer readers who are unfamiliar with the company to satiate their curiosity by doing a Google search. I will, however, mention some of the more important cool safety features. With the DiaLogue Premium HP power amplifier there is a new board for its famed Adaptive Auto-bias (AAB) circuit. Not only does the new AAB monitor and adjust the bias, but it will also indicate which output tube has gone bye-bye when a red LED lights up. Other new items include a larger power transformer, and silver plated Swiss made OCC wiring used in the signal path. Because of the humongous hand wound transformers in the PrimaLuna DiaLogue Premium HP, an installed soft start circuit prevents initial current rush upon turn on from frying them. There is also separate power and output transformer protection circuits to further safeguard what are the most expensive components of the unit. Transformer noise or hum is basically non-existent thanks to its AC Offset Killer circuit. Little or no transformer noise with a tube amplifier is a very good thing! I also didn’t hear any noise with any of the stock tubes. At the request of Kevin Deal of PrimaLuna USA who wanted me to see the layout, I removed the bottom panel and was happy to see the excellent execution and built quality, not unlike that of a fine automobile. Befitting a premium model, there are premium parts galore and the point-to-point wiring is all neat and tidy. So neat and tidy that I thought the wiring was performed by a machine, but Mr. Deal assured me otherwise. With the PrimaLuna DiaLogue Premium HP, there’s a lot of really nice and expensive stuff one does not usually get with other amplifiers for this amount of money. With its design philosophy, PrimaLuna has endeavored to minimize the fear of owning tube equipment. While it is still possible for something to go wrong, a faulty capacitor, resistor, or tube for example, the occurrence of a major catastrophe has been reduced to a very low probability. Even solid state or digital components can develop problems, so it is commendable that PrimaLuna have taken steps to make tube equipment that is as trouble free as possible. 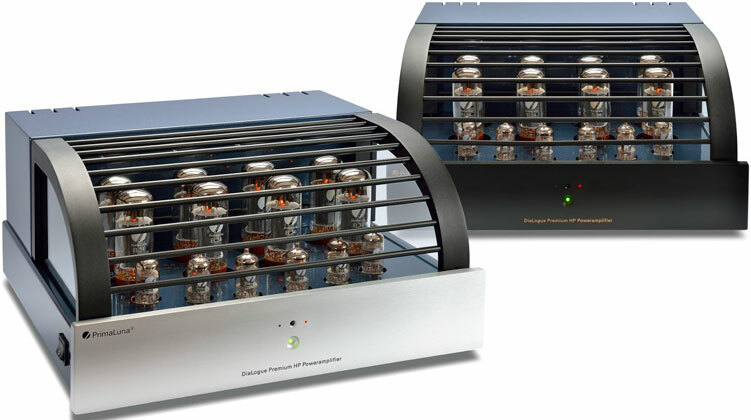 The HP stands for High Power or nearly double the watts of the standard DiaLogue Premium power amplifier, depending on the type of tube. With the stock EL34 output tubes, the standard DiaLogue Premium amplifier delivers 25 triode watts and 42 ultralinear watts, while the new HP version bumps up the watts to 42 triode and 72 ultralinear, respectively. 34, 77, 88, 12o, hut, hut! Snap the ball already! You can use any of these output tube types or a combination even, as the famous PrimaLuna photo shows; but I wouldn’t recommend it, unless you want a weird-looking tube complement. I requested from Kevin Deal a review sample with the black faceplate (also comes in silver) and received one of the first imported units, which was literally fresh off-the-boat. My review unit arrived with a complement of six 12AU7 tubes and eight EL34 output tubes (four per channel). The tube layout reminded me of chess or checker pieces ready to do battle. In this instance the amp was ready to tackle the musical apexes. The two innermost 12AU7s are input tubes, while the four outer ones are employed as drivers. I asked Kevin why four drivers instead of the usual two and he answered four provides a wider dynamic range. Wider dynamics is always a good thing in my audio book, thus bringing reproduced music closer to the dynamics of a live performance. I also requested an optional octet of Russian Tung-Sol KT120s to try in place of the stock EL34s, which Kevin sent in a separate package. This power amplifier is a heavy beast at almost eighty pounds, given my ninety-seven pound, kick-sand-in-the-face frame. For even more power, one can buy two PrimaLuna DiaLogue Premium HP and they become mono-block behemoths, essentially doubling the wattage. While no lightweights to begin with, PrimaLuna gear keeps getting heavier with each new model and in the case of the HP, a beefier power transformer added several more pounds to the standard DiaLogue Premium version. The DiaLogue Premium HP is outfitted with high quality speaker connectors for 4, 8 and 16 ohm loads, depending on your speakers’ average impedance. To change from stereo to mono operation and double your pleasure, buy another DP HP, then perform the following for both: flick a switch on the back panel; connect an RCA cable to the left input (marked mono) and speaker cable to the right output for 2, 4, or 8 ohm use, again depending on the speaker’s average impedance. The 2, 4, and 8 ohm labels are clearly marked at the bottom of the right output section. The DiaLogue Premium HP required a fairly long break-in period before reaching full stride. I estimate approximately 100 hours of operation were required before changes in sound came to a screeching halt. This is one of the few amps I am interested in. Quality and value. I bet they sound fantastic in a great analogue system. As for tube selection,I have tried KT88,KT120,El34 etc. The one tube to me that is the most musical top to bottom is the… TAD 6L6 WGC STR. Can the reviewer at some time try these and report back? Thanks. It’s difficult to borrow loaner tubes for audition from dealers/importers/manufacturers. Kevin is the rare exception. But if I do come across 6L6 outputs I will certainly write a follow-up to this review. Another informative and entertaining review. Thanks Paul! Great review Paul keep up the good work ! I recently tried some CV4003 and I agree with you, they sound great! The HP needs hours and hours to break in. Do not judge it to early after purchase. I have experimented with preamps and found Atma Sphere V 1 to bring the HP to the sublime.